Room blocks have been made at the following hotels. When you call to make your reservations, please mention “WI Society for Human Resource Management” to get the rates listed. **Special Note: Due to high call volumes it is recommended to use the booking website to make your reservation so you do not have a long hold time waiting to speak to a reservation specialist. Guarantee method: One-night room and tax due at time of reservation. Cancelation Policy: 72 hours or more before arrival date full refund minus $25.00 registration fee. Less than 72 hours before arrival date results in forfeiting entire deposit. Deadline to make reservation at group rate: September 15, 2019. 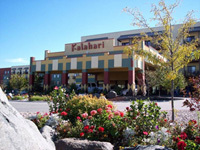 Extend Your Stay at the Kalahari! Limited Availability to extend your stay under reduced rates. Call the Kalahari for more details! Guarantee method: One night room and tax due at time of reservation. Cancelation Policy: Each individual has up to 7 days prior to arrival to cancel with a fee of 15% of your deposit. If you cancel 4-6 days prior to arrival, there will be a 30% fee, and 3 days or less of arrival, the deposit becomes non-refundable. Deadline to make reservations at group rate: September 16, 2019. Guarantee method: None at time of reservation - secure with credit card. Full payment is due at check in. Cancelation Policy: To avoid a cancellation fee of the first night’s room and tax; written notice must be received at least 48 hours prior to the reservation date. Deadline to make reservations at group rate: September 20, 2019. Guarantee method: Secure with credit card at the time of reservation. Full payment due at check in. Cancelation Policy: Less than 48 hours before arrival date results in forfeiting one night stay. **Hot complimentary breakfast included in stay. Group Code: SHR - Simply click on the URL link below and it will take you directly to the special rate. ** Note: To check availability on the website, please manually input the group's check-in and check-out dates prior to hitting the CHECK AVAILABILITY button. Cancelation Policy: The individual cancellation for reservations is 6pm the day prior to the reservation arrival. The cancellation penalty is one night’s room and tax, if the reservation is canceled after 6pm the day prior to the reservation arrival. Deadline to make reservations at group rate: October 1, 2019.